Jim MacIsaac founded Highland Sugarworks in 1986, utilizing his degree from the University of Vermont, his work experience within the food industry and his love of the outdoors. His knowledge in both food science and production set the groundwork for the quality of Highland’s products. While Highland Sugarworks distribution and product line continues to grow, the fundamental commitments to quality, service, and community remain the focal points of the company. Highland Sugarworks purchases pure maple syrup from hundreds of neighboring farms throughout New England, encouraging and supporting sustainable agriculture. The purchase of Highland Sugarworks maple syrup has a direct, positive impact on the farming community throughout New England. 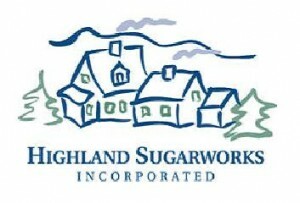 Highland Sugarworks has moved into a larger new location in December 2009. The new 37,600 square facility has been designed to accommodate additional high speed bottling as well as streamlining all aspects of product handling, warehousing and shipping. Highland Sugarworks’ focus on quality products and its dedicated well-trained staff, assure the packaging and distribution of some of the finest quality maple products available anywhere.